Can China’s ‘One Belt, One Road’ Save the US in Afghanistan? Expanding China’s direct interests in Afghanistan would open new avenues for U.S.-China cooperation there. Few observers can deny that Afghanistan is having trouble holding together. With the Islamic State (IS) and a resurgent Taliban chipping away at the country’s fragile foundations, the United States is scrambling to find new sources of help to prop up the Afghan state. China has long been seen as one of the most promising prospects for such help, and when Chinese President Xi Jinping made his first state visit to the United States in September 2015, President Barack Obama’s administration wasted no time courting him on cooperation in Afghanistan. As each side released its outcome statement from the visit, however, it became clear that the U.S. and China are quite literally not on the same page regarding Afghanistan. While the U.S. “fact sheet” on the visit put Afghanistan as its lead item, China buried U.S.-China cooperation on Afghanistan near the bottom of its statement—the 41st item of 49. A few weeks later, President Obama announced that U.S. combat troops would remain in Afghanistan for at least the remainder of his term in office. China, it seems, would not be the savior for Afghanistan that the United States was looking for. One major reason for this disconnect is that China’s interests in Afghanistan remain largely tied to a single issue: Uyghur separatist groups in China’s western frontier region of Xinjiang and their suspected ties to insurgent groups in Afghanistan.Some have pointed to the Uyghur connection as a potential hook to involve China more deeply in Afghanistan’s stabilization and reconstruction. 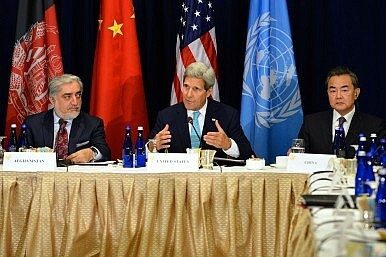 But while it is true that the Uyghur issue has spurred China to act constructively in Afghanistan in some respects, including substantial investment commitments and mediation of peace talks between the Afghan government and the Taliban, relying on the Uyghur connection alone to anchor China’s Afghanistan interest poses a number of problems. First, China’s policies toward its Uyghur population have long raised human rights concerns in Washington, and the United States’ refusal to label all Uyghur unrest as “terrorism” has frustrated China in bilateral discussions. The U.S. has also hesitated to expand counterterrorism cooperation with China for fear that China would use its newfound capabilities to persecute the broader Uyghur population. Second, China has been reluctant to act in Afghanistan on issues that lack direct implications for its concerns about Xinjiang. On top of a general predilection for non-interference, China views the U.S. nation-building misadventures in Iraq and Afghanistan as a cautionary tale. With its hands full of problems both domestically and in its immediate neighborhood, China fears getting sucked into a quagmire in some far-flung land. In short, China viewing Afghanistan as an extension of its Uyghur concerns limits both U.S. and Chinese willingness to cooperate in Afghanistan. The United States would balk at involving China in any way that helps China shore up its domestic position against Uyghur discontent, and China would be loath to lend a hand in any way that doesn’t. For the United States and China to get on the same page about Afghanistan, China must be convinced that its interest in Afghanistan goes beyond its domestic concerns. It happens that the time is ripe for the United States to do just that. There is no doubt that China is looking west, and looking hard. On the vanguard of China’s “March West” are two major international economic initiatives: the Silk Road Economic Belt and the 21st Century Maritime Silk Road, collectively known as “One Belt, One Road” (OBOR), which envision a vast infrastructure network built using Chinese capital that will connect China to Western Europe via the Eurasian heartland, including Afghanistan. For policymakers struggling to prop up Afghanistan’s economic and governance capacity, the promise of a flood of capital from the east is a godsend. China is already a major investor in Afghanistan, having poured billions of dollars into Afghan mining and energy enterprises. But aside from being another potential fount of investment, OBOR also presents a prime opportunity for the United States to diversify China’s interests in Afghanistan. Through active and targeted offers of cooperation, the United States can shape specific projects within the OBOR framework to tie China more closely to Afghanistan’s rise or fall. One place to start is the China-Pakistan Economic Corridor (CPEC), a proposed transportation and energy infrastructure network that will link northwestern China to the Arabian Sea via Pakistan, and one of few specific OBOR projects articulated so far. The planned routes traverse some of Pakistan’s most volatile border regions adjacent to Afghanistan; with $46 billion USD in OBOR funds at stake, the project undoubtedly gives China a direct interest in Afghanistan’s security. The U.S. can up China’s Afghanistan ante by exploring linkages between the CPEC and the United States’ own “New Silk Road Initiative.” Launched in 2011 to revitalize Afghanistan by forging economic connections with the country’s Central and South Asian neighbors, the New Silk Road Initiative has faltered due to low political will in the U.S. to commit the necessary resources and a lack of desire among the Central Asian states to expand regional cooperation, particularly with Afghanistan. If coordinated properly, the CPEC and the New Silk Road could each boost the other’s chances of success. In particular, the New Silk Road’s Central Asia South Asia Electricity Transmission and Trade Project (CASA-1000), a transmission grid that would allow the Central Asian states to sell electricity to Afghanistan and Pakistan, dovetails with the CPEC’s proposed upgrades to Pakistan’s electricity infrastructure. Giving China a stake in the success of CASA-1000 and the New Silk Road more generally would be a promising step toward getting China to see more in Afghanistan than its Uyghur concerns. Expanding China’s direct interests in Afghanistan would open new avenues for U.S.-China cooperation there. It would motivate both sides to boost coordination on Afghan security, while shifting the focus of this cooperation away from the fraught issues of counterterrorism and China’s domestic concerns. A China that is willing to contribute more toward military assistance, political mediation, counternarcotics, and border security in Afghanistan would be a huge boon for both Afghanistan and the United States. As growing threats thwart a smooth U.S. withdrawal from its longest-ever war, now is the time for the U.S. to seize any opportunity to build a robust partnership with China on Afghanistan. Andi Zhou is a Program Coordinator for the China, East Asia and United States Program, working out of the EastWest Institute’s New York Center. This article has previously been published on the EastWest Institute Policy Innovation Blog.